A four-man rowing crew, skippered by a Scotsman, Leven Brown, remain on course today to smash a 114-year-old record for rowing across the Atlantic from the US to the UK. At 6am this morning, the quartet were aboard their 23-feet boat, Artemis Investments, traveling at 2.71 knots off the south-west coast of Ireland, having covered 3,062 miles of their 3,246-mile trip from New York to the Scilly Isles. By midday today the crew had been at sea for 988.5 hours, having left New York on 17 June (pictured). They expect to cross the finish line at St Mary’s, Scilly Isles, sometime this weekend, probably on Saturday, dependent on weather conditions. The US-UK record of 55 days and seven hours was set in 1896 by two Norwegian fishermen, George Harbo and Frank Samuelsen, aboard The Fox. That record has been challenged many times but remains unbeaten – so far. 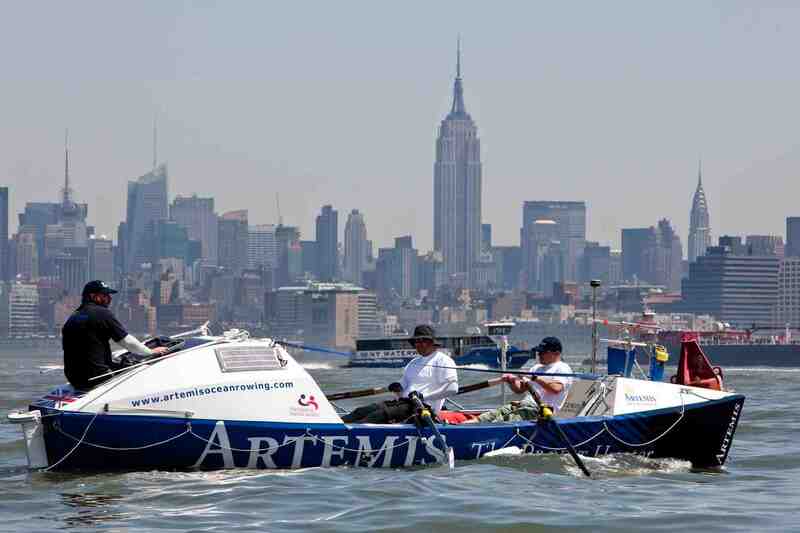 Brown’s crew will beat the oldest record in ocean rowing if they arrive at St Mary’s no later than 7.30am local time on 12 August, so remain on course to smash the record. The crew comprises Brown, 37, who is a former stockbroker, now a lecturer; Don Lennox, 42, a fellow Scot from Bellshill, Lanarkshire; Ray Carroll, a former Irish junior international rower from Galway; and Livar Nysted, a former multiple national champion rower from the Faroe Islands. The foursome have encountered 30-feet waves, have had an encounter with a whale, nearly come to grief after near misses with a tree and a submerged container, had a man knocked overboard in a storm (Nysted, safely rescued) and they were all struck down with serious food poisoning at one stage. On-board surgery on an inflamed and painful in-growing toenail was performed on Carroll by Brown at one point last week – with a Swiss army knife and a pair of pliers. The crew are reported to be in good spirits and are filing regular diary updates via iridium phone and email. The journey – which is also raising money for charities – can be followed here.